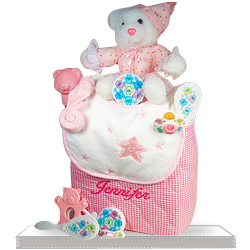 Personalize your new baby boy hooded towel plush bear gift set. This is produced in the USA from soremium quality ring spun cotton terry fabric; this design is so absorbent and soft. The length of the towel is 30" x 36"and also come with a generous sized hood to dry and fully cover baby's head after bath time. 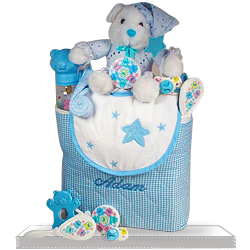 This is a thoughtful baby gift, with attractively trimmed and a light blue gingham binding, this towel along with the 10" plush bear makes a thoughtful baby gift. To ensure your surprise gift stays a surprise, our company does not ship invoices along with the gift, and instead will email them directly to the buying party upon purchase. We Ship from New York ! ALL CHARGES ARE PER ADDRESS. Gift arrived on exact day as stated. My sister loved the beautiful presentation. She said it was just what she wanted for her baby girl. Copyright © 2019. Gift Baskets 4 Baby. All Rights Reserved.